Outdoor fire pits create a great atmosphere that rivals an old-fashioned campfire. However, like campfires, fire pits can create a fire risk. You can protect your family, friends, home and neighborhood form errant sparks, popping embers, and dangerous flare-ups with spark screen. 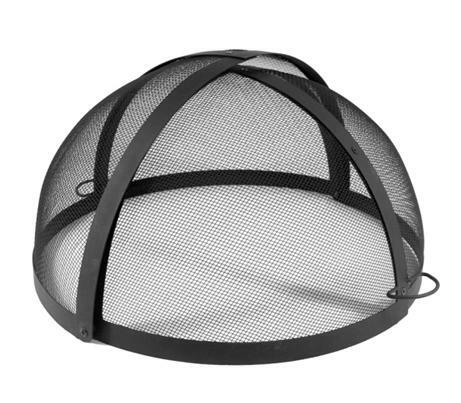 This fire pit spark screen is dome shaped and 28 inches in diameter. It opens easily to give quick access to the fire. It is made by Asia Direct and works with perfectly with Asia Direct fire pits. How does the screen open for quick access? Does it have a fireproof finish? One half of the screen will rotate 180 degrees, back beneath the other half for access. The screen is indeed coated with a high temperature ceramic paint. Is this shipped flat? Is there assembly required? Per the manufacturer, this item ships in a box 25 x 24 x 10 inches. The screen does require assembly. Good fit, exactly what I ordered. Arrived promptly. fits as measurements indicated.